I actually took this photo a few months ago and only just found it now when I was going through some stuff on my computer. Luckily enough I had another Gambrinus in the fridge and thought that it would be the perfect time to drink it. This beer probably also qualifies as a fridge regular, I normally have a few lying around at any given time. This is a very nice high end lager, at a relatively cheap price considering the half litre bottle. I've got no idea how long this has been hanging around in the fridge, so hopefully it's still nice and fresh and can live up to what I've just said about it. Gambrinus pours a beautiful deep golden colour with adequate carbonation rising to a big white airy head. The retention is excellent and the lacing is one of the best you will find in any beer. It's close to the perfect looking beer, let alone the perfect looking lager! It's hard to get a better start to any beer than what Gambrinus 11 offers up! Hopefully everything else will fall into place. It has a typical Czech pilsner nose, it smells all of Saaz hops. For people trying to learn how to distinguish different varieties of hops, Saaz is the one to start with. It has a very distinct spicy herbal smell, which is even more pronounced when you taste it. When you really concentrate you can smell a slight malt backbone, but it's hard to distinguish with all the hops that the nose of this beer has on show. So this beer isn't quite tasting as it should, I think it may have been in the fridge that little bit too long... The Saaz hops are there and, as expected, are slightly spicy and herbal but they aren't quite as crisp as they could be. There are more malts than the nose would suggest and it seems well balanced, but this one isn't quite doing it for me. Normally this beer is a fair bit better than this, however it is still reasonably easy to drink. 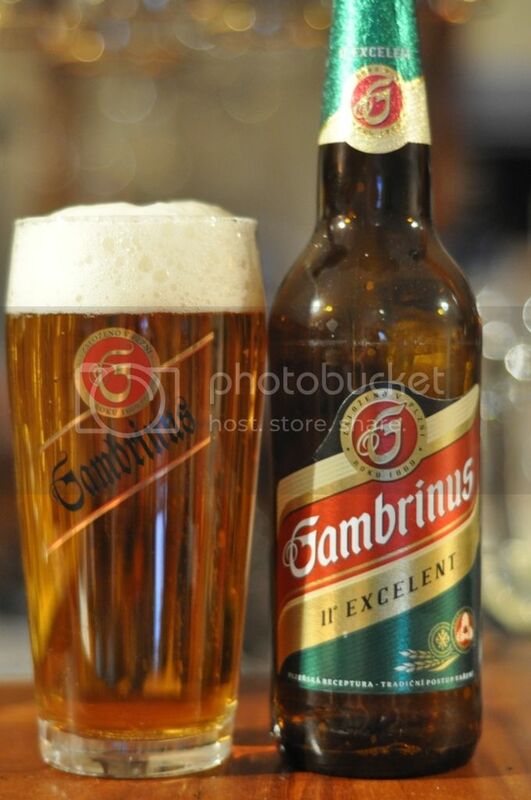 Gambrinus 11 Excelent is a more than serviceable Czech pilsner. I'm being slightly harsh on this beer because I expected more from it than what this particular example offered. Normally this beer has a bit more bitterness and I expect that this one has skunked slightly from however long its been in the fridge. I can't taste any skunk but the beer isn't quite as fresh as it should be. When this beer is fresh it can be spectacular, if you see it ask someone in the store if it's fresh, if it is buy some!